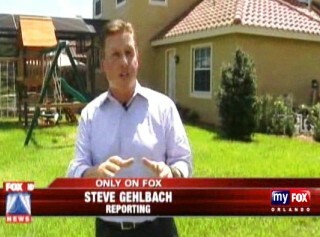 WINDERMERE, Fla. (WOFL FOX 35) - A homeowner in Orange County is in nasty fight with his Home Owners Association. 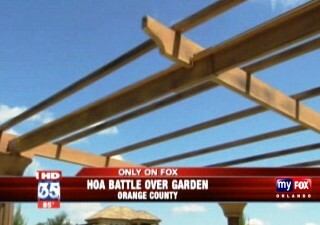 Neither side will budge over a 6-and-a-half foot pergola in his backyard. The dispute will go to mediation in September, then possibly to court. Richard Cook built his million dollar home in the Tildens Grove subdivision in Windermere and moved in last November. From the beginning, he says the HOA wanted him to rip out all the landscaping in his backyard, but now have sent notice to remove the pergola. "We want to be able to enjoy the view of the lake and sit outside. That's why we bought this lot," said Cook. enforcement and discrimination. Cook's pergola is one of three in the subdivision, along with a giant trampoline and numerous children's play sets that have all been approved by the HOA. "I think it's a power play. They have to have their way. They're a board with nothing to do," said Cook. Cook says he plans to fight to keep his pergola. "Their heels are dug in. They're not going to give in. They're going to take it as far as they can, and so am I to defend myself."